A transformer-feeder include a transformer directly connected to a transmission line circuit without the intermediation of a HV switchgear. The saving in HV switchgear so achieved is unfortunately lowered by increased complication in the necessary protection. The primary requirement is intertripping, since the feeder protection remote from the transformer will not respond to the low current fault conditions that can be detected by restricted earth fault and Buchholz protections. Either unrestricted or restricted protection can be applied. Moreover, the transformer-feeder can be protected as a single zone or be provided with separate protections for the feeder and the transformer. Examples are shown in Figure 1. In the latter case, the separate protections can both be unit type systems. An adequate alternative is the combination of unit transformer protection with an unrestricted system of feeder protection, plus an intertripping feature. The following sections describe how non-unit schemes are applied to protect transformer-feeders against various types of fault. High-speed protection against phase and earth faults can be provided by distance relays located at the end of the feeder remote from the transformer. The transformer constitutes an appreciable lumped impedance. It is therefore possible to set a distance relay zone to cover the whole feeder and reach part way into the transformer impedance. With a normal tolerance on setting thus allowed for, it is possible for fast Zone 1 protection to cover the whole of the feeder with certainty without risk of over-reaching to a fault on the low voltage side. Although the distance zone is described as being set ’half way into the transformer’, it must not be thought that half the transformer winding will be protected. The effects of autotransformer action and variations in the effective impedance of the winding with fault position prevent this, making the amount of winding beyond the terminals which is protected very small. The value of the system is confined to the feeder, which, as stated above, receives high-speed protection throughout. A distance scheme is not, for all practical purposes, affected by varying fault levels on the high voltage busbars and is therefore the best scheme to apply if the fault level may vary widely. In cases where the fault level is reasonably constant, similar protection can be obtained using high set instantaneous overcurrent relays. IF = steady state r.m.s value of the fault current, which when fully offset, just operates the relay. The instantaneous overcurrent relays must be set without risk of them operating for faults on the remote side of the transformer. Where IF2 is the fault current under maximum source conditions, that is, when ZS is minimum, and the factor of 1.2 covers possible errors in the system impedance details used for calculation of IF2, together with relay and CT errors. As it is desirable for the instantaneous overcurrent protection to clear all phase faults anywhere within the feeder under varying system operating conditions, it is necessary to have a relay setting less than IF1 to ensure fast and reliable operation. It can be seen that for a given transformer size, the most sensitive protection for the line will be obtained by using relays with the lowest transient overreach. It should be noted that where r is greater than 1, the protection will not cover the whole line. Also, any increase in source impedance above the minimum value will increase the effective setting ratios above those shown. The instantaneous protection is usually applied with a time delayed overcurrent element having a lower current setting. In this way, instantaneous protection is provided for the feeder, with the time-delayed element covering faults on the transformer. When the power can flow in the transformer-feeder in either direction, overcurrent relays will be required at both ends. In the case of parallel transformer-feeders (figure 3), it is essential that the overcurrent relays on the low voltage side be directional, operating only for fault current fed into the transformer-feeder. If non-unit, non-directional relays are applied to parallel feeders having a single generating source, any faults that might occur on any one line will, regardless of the relay settings used, isolate both lines and completely disconnect the power supply. With this type of system configuration, it is necessary to apply directional relays at the receiving end and to grade them with the non-directional relays at the sending end, to ensure correct discriminative operation of the relays during line faults. Instantaneous restricted earth fault protection is normally provided. When the high voltage winding is delta connected, a relay in the residual circuit of the line current transformers gives earth fault protection which is fundamentally limited to the feeder and the associated delta-connected transformer winding. The latter is unable to transmit any zero sequence current to a through earth fault. When the feeder is associated with an earthed star-connected winding, normal restricted earth fault protection is not applicable because of the remoteness of the transformer neutral. Restricted protection can be applied using a directional earth fault relay. A simple sensitive and high-speed directional element can be used, but attention must be paid to the transient stability of the element. Alternatively, a directional IDMT relay may be used, the time multiplier being set low. The slight inverse time delay in operation will ensure that unwanted transient operation is avoided. When the supply source is on the high voltage star side, an alternative scheme that does not require a voltage transformer can be used. The scheme is shown in Figure 4. For the circuit breaker to trip, both relays A and B must operate, which will occur for earth faults on the feeder or transformer winding. External earth faults cause the transformer to deliver zero sequence current only, which will circulate in the closed delta connection of the secondary windings of the three auxiliary current transformers. No output is available to relay B. Through phase faults will operate relay B, but not the residual relay A. Relay B must have a setting above the maximum load. As the earthing of the neutral at a receiving point is likely to be solid and the earth fault current will therefore be comparable with the phase fault current, high settings are not a serious limitation. 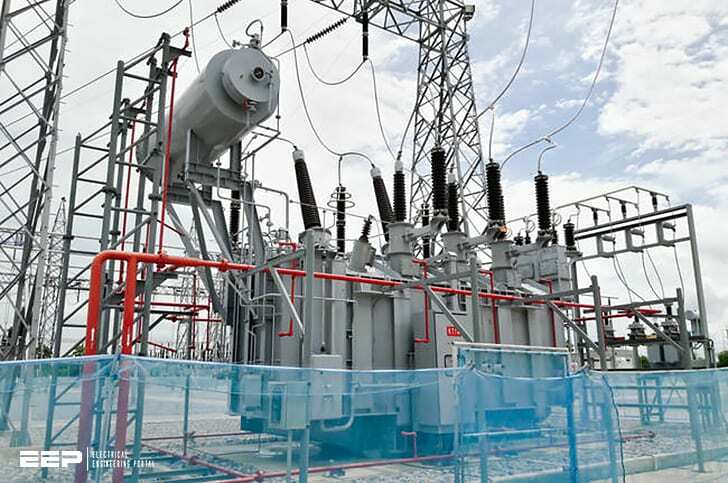 Earth fault protection of the low voltage winding will be provided by a restricted earth fault system using either three or four current transformers, according to whether the winding is delta or star-connected. The feeder portion of the transformer-feeder will have an appreciable capacitance between each conductor and earth. During an external earth fault the neutral will be displaced, and the resulting zero sequence component of voltage will produce a corresponding component of zero sequence capacitance current. In the limiting case of full neutral displacement, this zero sequence current will be equal in value to the normal positive sequence current. The resulting residual current is equal to three times the zero sequence current and hence to three times the normal line charging current. The value of this component of in-zone current should be considered when establishing the effective setting of earth fault relays. The basic differences between the requirements of feeder and transformer protections lie in the limitation imposed on the transfer of earth fault current by the transformer and the need for high sensitivity in the transformer protection, suggesting that the two components of a transformer-feeder should be protected separately. This involves mounting current transformers adjacent to, or on, the high voltage terminals of the transformer. Separate current transformers are desirable for the feeder and transformer protections so that these can be arranged in two separate overlapping zones. The use of common current transformers is possible, but may involve the use of auxiliary current transformers, or special winding and connection arrangements of the relays. Intertripping of the remote circuit breaker from the transformer protection will be necessary, but this can be done using the communication facilities of the feeder protection relays. Although technically superior, the use of separate protection systems is seldom justifiable when compared with an overall system or a combination of non-unit feeder protection and a unit transformer system. An overall unit system must take into account the fact that zero sequence current on one side of a transformer may not be reproduced in any form on the other side. This represents little difficulty to a modern numerical relay using software phase/zero sequence compensation and digital communications to transmit full information on the phase and earth currents from one relay to the other. However, it does represent a more difficult problem for relays using older technology. The line current transformers can be connected to a summation transformer with unequal taps, as shown in Figure 6(a). This arrangement produces an output for phase faults and also some response for A and B phase-earth faults. However, the resulting settings will be similar to those for phase faults and no protection will be given for C phase-earth faults. An alternative technique is shown in Figure 6(b). The B phase is taken through a separate winding on another transformer or relay electromagnet, to provide another balancing system. The two transformers are interconnected with their counterparts at the other end of the feeder-transformer by four pilot wires. Operation with three pilot cores is possible but four are preferable, involving little increase in pilot cost. To ensure that both the high and low voltage circuit breakers operate for faults within the transformer and feeder, it is necessary to operate both circuit breakers from protection normally associated with one. The technique for doing this is known as intertripping. The necessity for intertripping on transformer-feeders arises from the fact that certain types of fault produce insufficient current to operate the protection associated with one of the circuit breakers. Fault #2 – Earth faults on the star winding of the transformer, which, because of the position of the fault in the winding, again produce insufficient current for relay operation at the remote circuit breaker. Fault #3 – Earth faults on the feeder or high voltage delta-connected winding which trip the high voltage circuit breaker only, leaving the transformer energized form the low voltage side and with two high voltage phases at near line-to-line voltage above earth. Intermittent arcing may follow and there is a possibility of transient overvoltage occurring and causing a further breakdown of insulation. An alternative to intertripping is to detect the condition by measuring the residual voltage on the feeder. An earth fault occurring on the feeder connected to an unearthed transformer winding should be cleared by the feeder circuit, but if there is also a source of supply on the secondary side of the transformer, the feeder may be still live. The feeder will then be a local unearthed system, and, if the earth fault continues in an arcing condition, dangerous overvoltages may occur. A voltage relay is energized from the broken-delta connected secondary winding of a voltage transformer on the high voltage line, and receives an input proportional to the zero sequence voltage of the line, that is, to any displacement of the neutral point. The relay normally receives zero voltage, but, in the presence of an earth fault, the broken-delta voltage will rise to three times the phase voltage. Earth faults elsewhere in the system may also result in displacement of the neutral and hence discrimination is achieved using definite or inverse time characteristics.